1. Möller et al. J Appl Physiol. 2015. 1. Mündel et al. J Appl Physiol. 2013. Modeling the reduction of anatomical deadspace - In a world first using Computational Fluid Dynamics (CFD), CT data of an actual 44 year old male was 3D printed and included in a physical model of the human airway. The model was used to demonstrate the concentration of CO2 in the airway in unassisted breathing, and the reduction of CO2 with Optiflow delivered at 40 L/min. The model suggests that Optiflow effectively decreased the ratio of deadspace to tidal volume increasing alveolar ventilation. 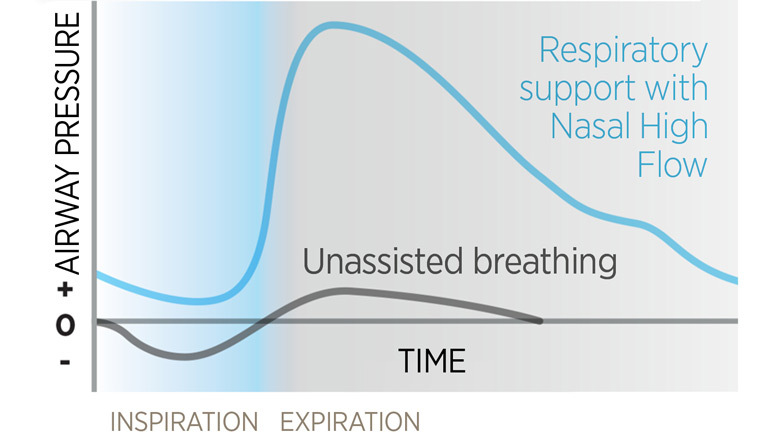 Pressure dynamically changes depending on patient breathing patterns and delivered flow. 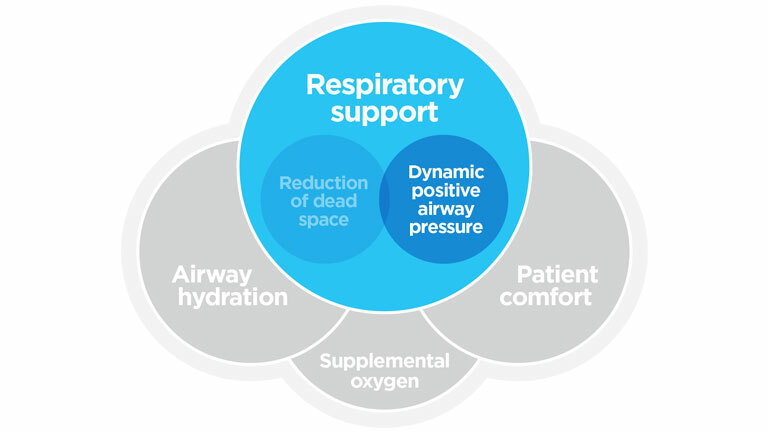 The pressure dynamically changes depending on the patient's breathing pattern and the flow of gas delivered to the patient. Optiflow Nasal High Flow reduces inspiratory resistance making inspiration easier, and increases expiratory resistance prolonging expiration. 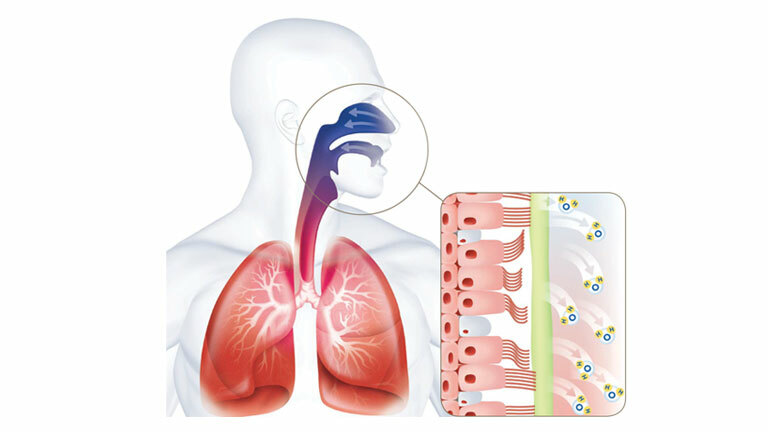 This promotes slow, deep breathing which increases alveolar ventilation. How much pressure can I get? Corley et al. 2011 showed once Optiflow is commenced in patients post-cardiac, there is a significant increase in areas of lung aeration. This change reflects enhanced lung volume and tidal volume. 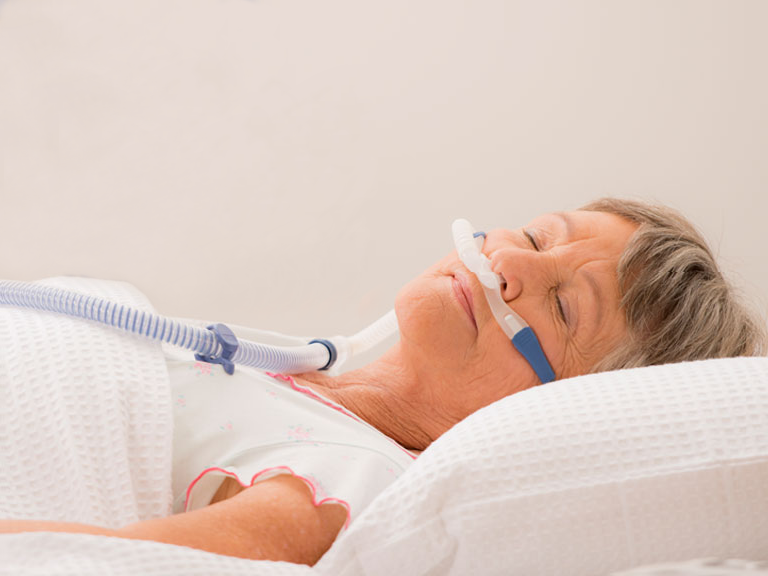 The researchers determined a strong correlation between airway pressure (Paw) and end-expiratory lung impedance (EELI). Paw increased by 3.0 cmH20 and EELI increased by 25.6%. 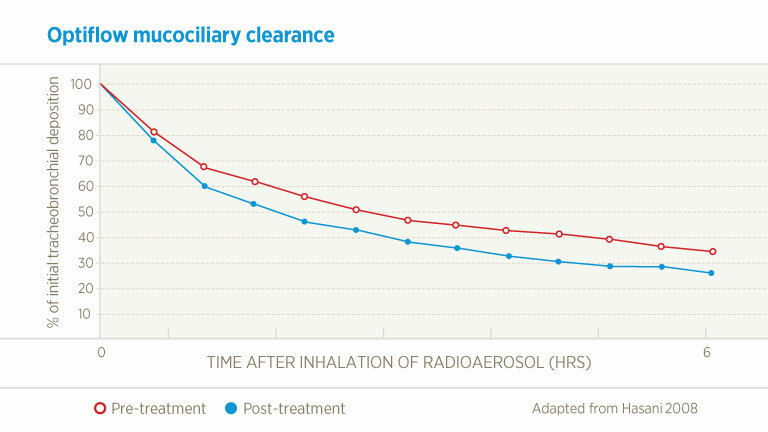 EELI is a surrogate for end expiratory lung volume. Optimal humidity emulates the natural balance of heat and moisture that occurs normally in healthy lungs and is essential to maintain physiological stability in already compromised airways. Humidity enables the comfortable delivery of high flows. Conditioned gas reduces drying of the airway epithelium which helps maintain function of the mucociliary transport system, clearing secretions and reducing the risk of infections. 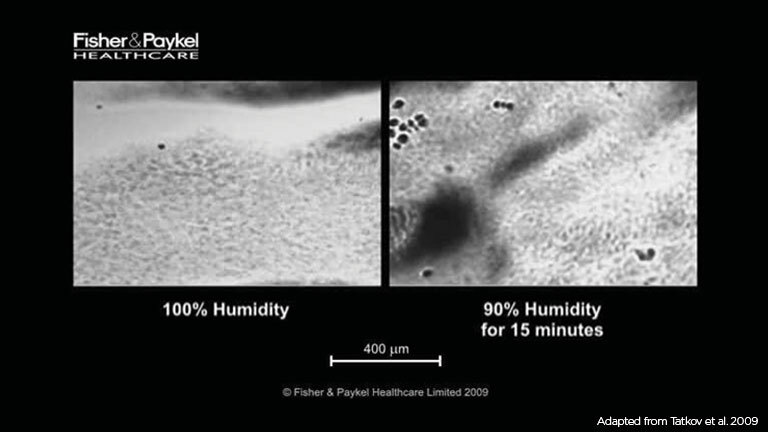 This video microscopy shows the negative impact of reduced humidity on mucociliary transport. 1. Hasani et al. Chron Respir Dis. 2008. Better patient comfort promotes improved patient compliance. 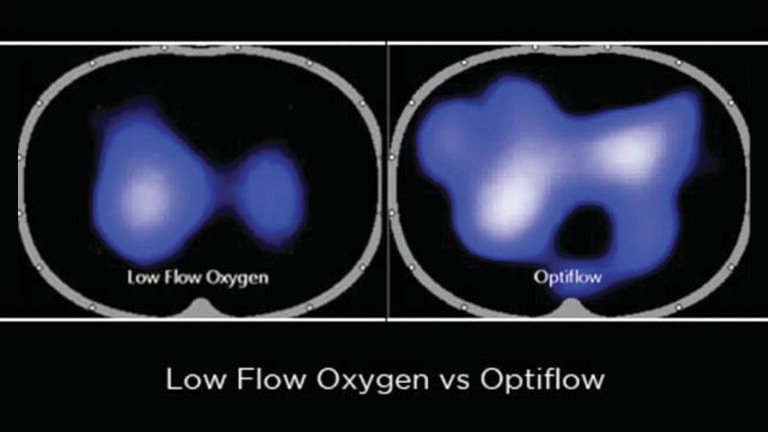 Clinical evidence suggests that use of Optiflow provides improved comfort compared to conventional oxygen delivery devices1,2. A study in JAMA3 found significantly reduced skin breakdown and noted a lower nurse workload with Optiflow™ than with BPAP. Patients are able to eat, drink and sleep with the Optiflow cannula and can talk with their caregivers and families. 1. Roca et al. Respir Care. 2010. 2. Lenglet et al. Respir Care. 2012. 3. Stéphan et al. JAMA. 2015. Confidence in the delivery of blended humidified oxygen. 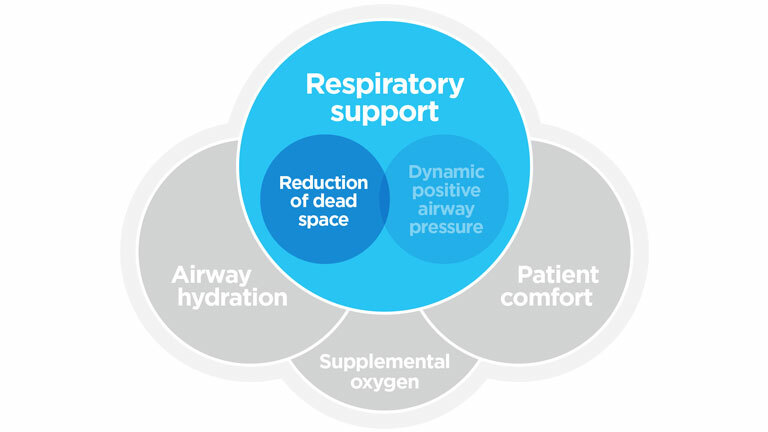 When supplemental oxygen is required, Optiflow can provide flows up to 60 L/min to meet peak inspiratory demand, thereby reducing O2 dilution by room air. 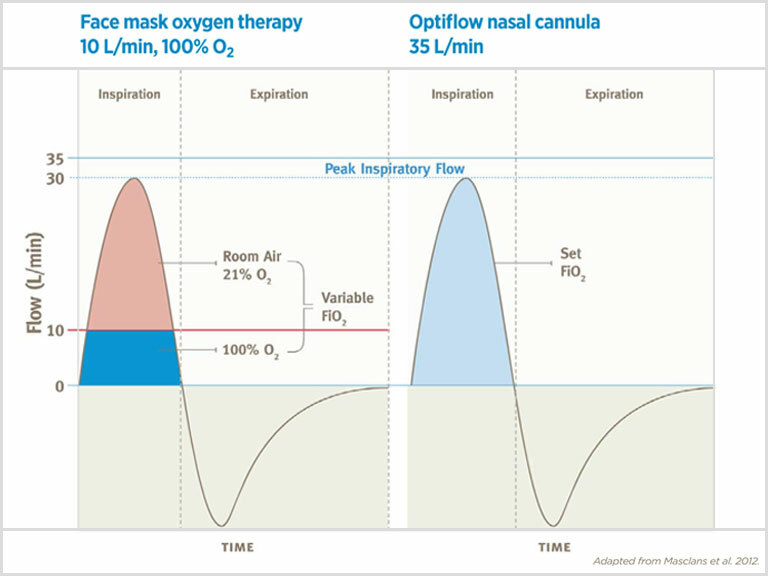 In the diagram at right, the maximum oxygen flow from a face mask is limited to approximately 10 L/min which is not sufficient to meet the patient's peak inspiratory demand. To reconcile the difference, room air is entrained diluting the oxygen being delivered. 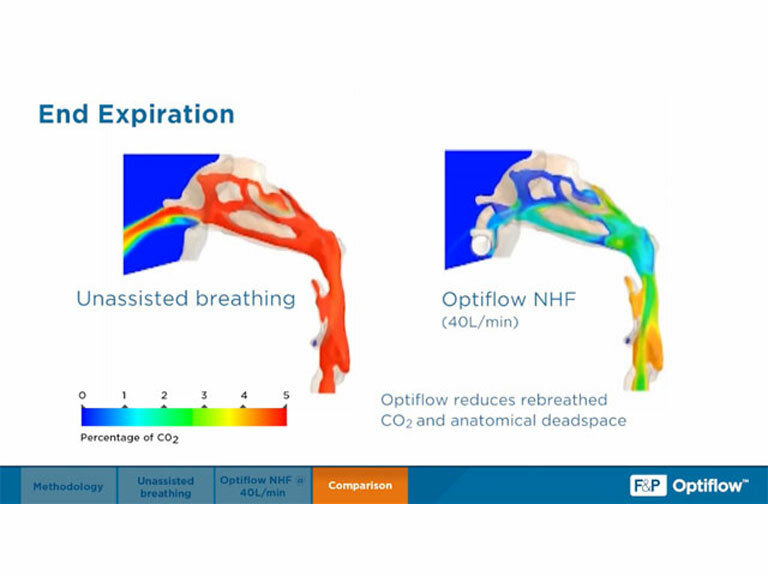 By contrast, Optiflow is able to meet this patient's peak inspiratory demand of 30 L/min ensuring an accurate delivery of FiO2 to the patient.